"This is a great kit" - Sound on Sound Magazine. 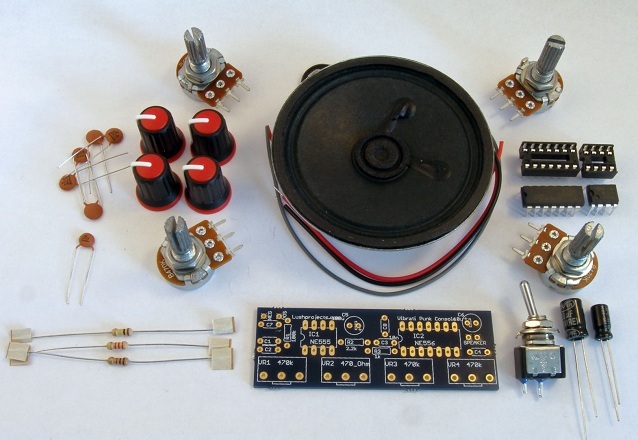 The Vibrati Punk Console electronics kit is for anyone wanting to learn to build electronics or for a a more experienced builder who wants a simple evening project. It is a great source of new sounds for musicians and artists wanting retro electronic bleeps . Kids and adults will have fun experimenting with the range of possible sounds. It's a nice project for anyone wanting to something for their tweenage children to "build with dad" (or mum). The Vibrati Punk Console provides four controls which provide a rich range of warbles, squawks, buzzes, screams and tone sequences. The circuit is a "version 2.0" development of the original “Stepped Tone Generator” or “Atari Punk Console” designed by Forrest M. Mims III. In it's simplest mode the Vibrati Punk Console operates just like the Atari Punk Console and produces the same sounds. New effects are added using a Low Frequency Oscillator (LFO) which modulates the Atari Punk Console. This creates a much wider and dirtier range of sounds. "All in all a cracking little starter project"
Once you've got the basic circuit built head over the the "use" page for suggested modifications to enhance the circuit and a guide to box mounting. The kit is an excellent platform for experimentation and circuit bending. 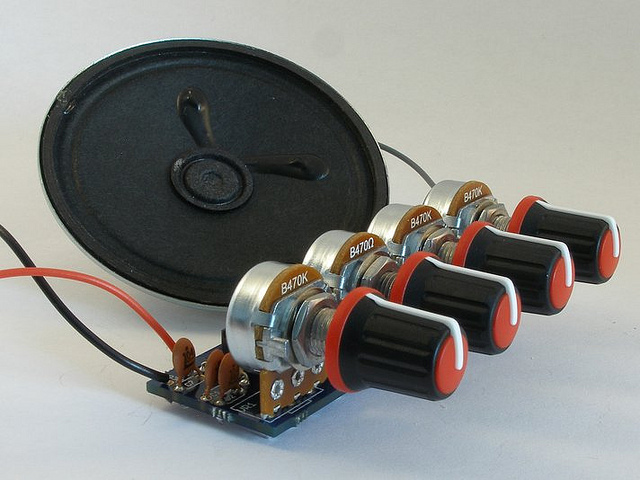 The kit will fit in coffee tins (from your supermarket) to make a "Coffee Can Synthesizer".